The history of organized anesthesiology in Indiana precedes the ISA with the founding of the Committee on Anesthesia and later the Section of Anesthesia of the Indiana State Medical Association (ISMA). As early as 1926, the ISMA had a Committee on Anesthesia. 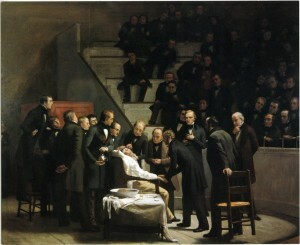 The Section on Anesthesia became the fourth Section of the ISMA largely through the leadership of Floyd Romberger, M.D. of Lafayette. In August, 1934, Romberger concluded that organized medicine was the highway that anesthesia needed to travel to “… emerge from the clinging morass and the apparently inextricable maze, both of which were retarding nor only our spiritual and professional growth, but also our just and lawful recognition.” The following month, he arranged a meeting of more than thirty anesthetists from across the state. On October 11, 1934, the Section on Anesthesia of the ISMA was founded with Romberger as Chairman, Charles Combs, M.D. of Terre Haute as Vice-Chairman and Lillian Mueller, M.D. of Indianapolis as Secretary. The Section of Anesthesia was an active organization for many years holding annual meetings that included both state and national speakers. The American Society of Anesthetists became the American Society of Anesthesiologists through a name change on April 12, 1945. The following year, twenty-six regional societies, state sections and sections of the ASA could be identified including the Section on Anesthesia of the Indiana State Medical Society. At the 1947 ASA Annual Meeting, a new constitution was adopted by the society. It included a provision for an Executive Committee, a Board of Directors, State Component Societies and a House of Delegates. The first Component Society (Minnesota) was organized on November 15, 1947 and accepted by the Board on December 3, 1947. The Indiana Society of Anesthesiologists became the twenty-fifth ASA Component Society with its founding July 12, 1948. William H. Lane, M.D. of South Bend was the first President of the ISA. The ISA has been and continues to be an active organization of Indiana anesthesiologists. It has benefited from the involvement of many anesthesiologists in leadership positions. A listing of known ISA presidents follows. 1950: William B. Adams, M.D. 1956: George E. Paine, M.D. 1961: Russell E. Havens, M.D. 1962: Douglas J. Giorgio M.D. 1968: W. M. Matthews, M.D. 1972: C. Herbert Spencer, M.D.